happy birthday to me! =D. this salad was amazing. I mean, it looks amazing right? that’s because it was. but for 20,000won I am not exactly sure if it’s worth it. everything was great but some of the vege tastes a little weird =S. 이 연어 샐러드는 사진 잘 나온것 뿐만 아니라 실제로도 맛있었다! 야채에 약간 이상한 남새 있었지만 딴 것은 짱 냔냠! 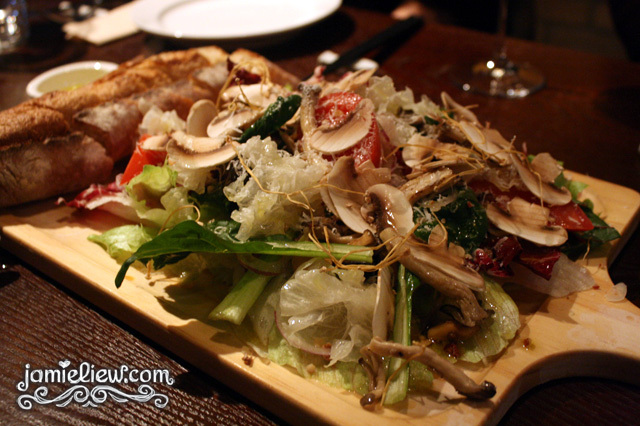 근데 가격은.. 2만원입니당 ㅠ.
the mushroom salad was great as well but I think I prefer the salmon one in both presentation and taste. but this was good too! 버섯 좋아하시면 이 샐러드도 맛있었다. 저는 무적건 연어를 선호하다. 홍대에 은영했을 때부터 유명한 페페로니만 있었던 특별한 파스타! 우거지 스파게티니! 전 완전 맛나게 먹었는데 내 외국인 친구들은 별로 좋아하지 않았다. 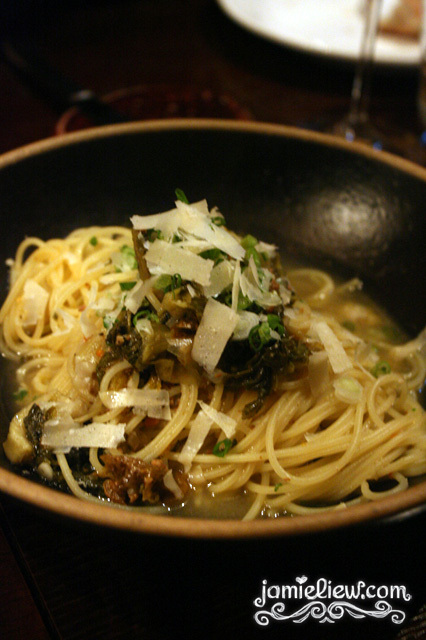 흠.
the custom made pasta! it was a platter for 3 and it costs 45,000won. it wasn’t as good as the other pasta’s but it’s decent. I guess this became so-so because the rest were just amazing. =S. they did not skimp on the seafood though. those prawns were so fresh they were literally dancing in my mouth! 좋아하는 것을 셰프님에게 말하고 우리의 적성맞게 만든 파스타! 3인분이래요. 여기 셰프님 젊고 잘생기고 굉장히 친절해서 또 보고싶었는데 제가 갔을 때 콘디션 별로 안 좋았나봐요 약간 행복하지 않은 느낌? ㅠ. 그런데 우리 테이블의 서버는 정말 귀엽고 서비스도 정말 잘하셨어요! <3. 이 파스타의 맛은.. 평범하다. 근데 싱싱한 해물을 많이 넣어서 좋았다. 45,000원이였다. 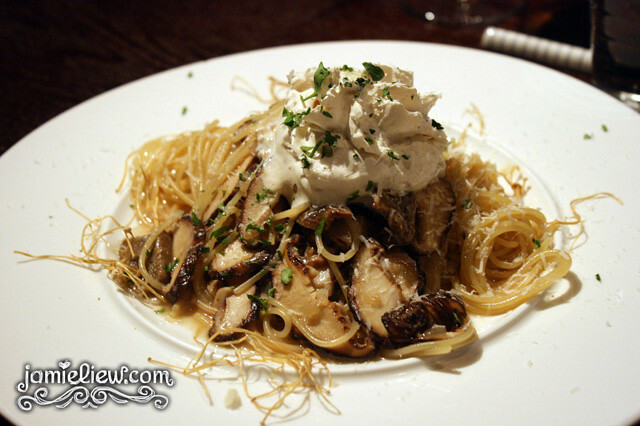 yummy mushroom spaghettini with mushroom cream for the mushroom lovers! like myself hehe. this costs 20,000won. 포르치니 스파게티니도 넘넘 맛있었당 <3. 전 버섯을 좋아하니까 ㅋㅋㅋ. 20,000원이였다. 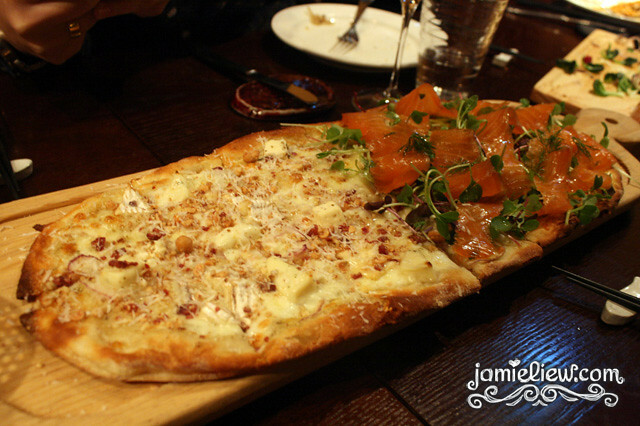 the 4-type of cheese and salmon pizza was…… beyond words. the crust was so crisp and everything just seems to go together. I wouldn’t say it’s pizza-like but it’s more like wine food. the cheese part especially. I greedily ate two slices of the cheese one. I am a huge fan of Camembert cheese. 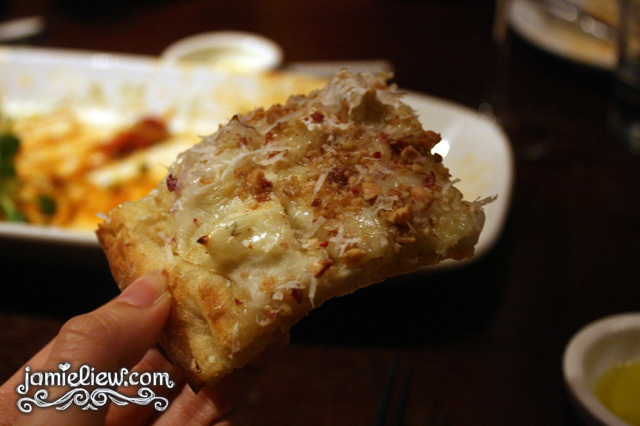 and they were really generous on it and having a sip of wine after a bite of that cheese pizza was just… heavenly. 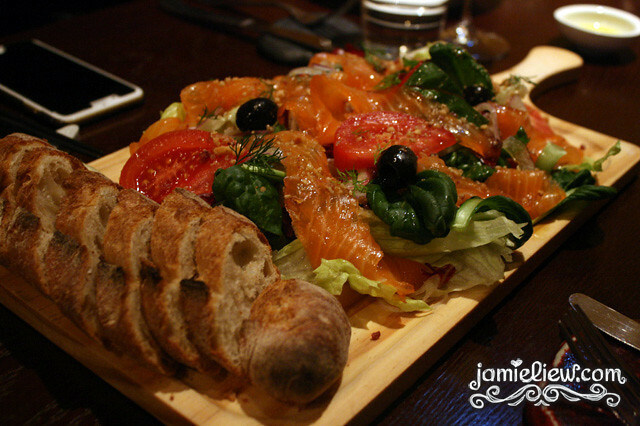 the smoked salmon was very fresh too! absolutely loved this one. I forgot how much this costs but I am guessing it was around 27,000won. 이 피자는.. 완전 제 사랑이였다. <3. 반 4가지의 치즈고 반 훈제연어. 카망베르 지츠 가득해서 짱 사랑함. 피자 한입 와인 한 입. 더 완벽한 것이 없을 듯해요. look at that cheese! 냠냠. since Korea don’t sell duck meat very much so I decided to order this. but it came out to a total surprise as it was.. amazing. 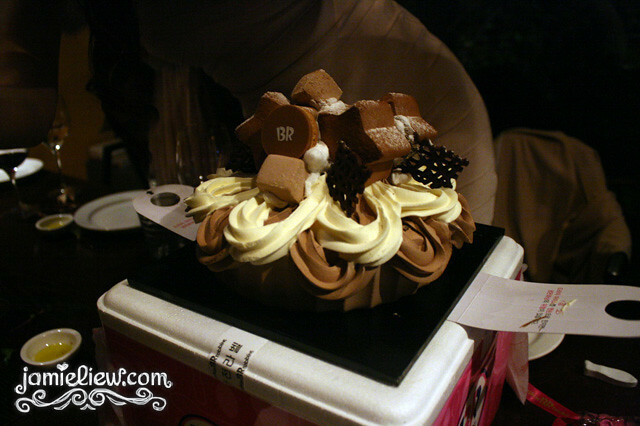 for such a small portion it costs a hefty 23,000won (I think. or was it 25,000won hmm.) but every bite of it was just phenomenal. it’s basically the best dish of all. 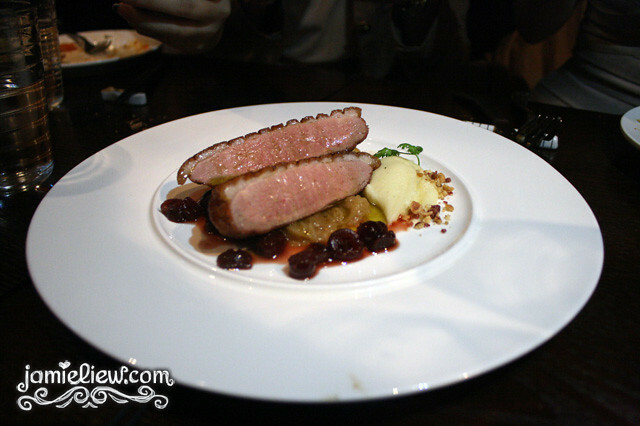 it had cranberries, mashed potatoes and I think they have caramelized onions too. 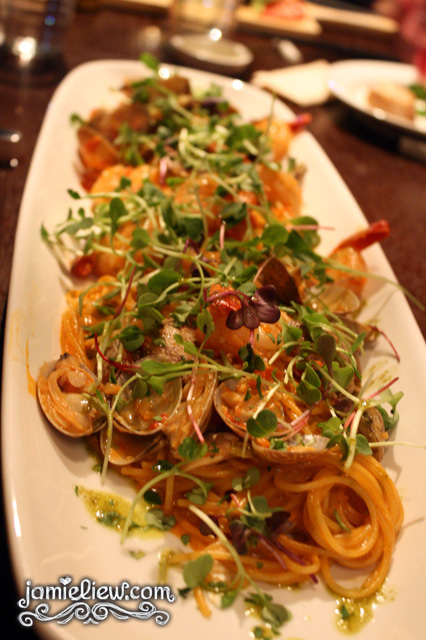 sorry the picture was taken at a pretty bad angle but….. if you ever make it to Prep, you HAVE to order this. 한국에서 오리고기 잘 없어서 시키는건데.. 전 메뉴의 가장 맛있던 것인 것 같다. 23,000원 쯤인 것 같다. 크랜베리도 있고 매쉬포테이토도 있고. 프렙 가면 이것을 꼭 시켜요!!! 정말 고급스럽고 맛도 독특했다. 100점에서 110점이다. 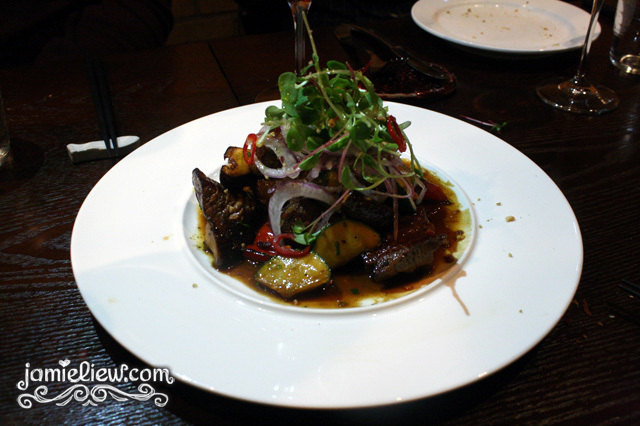 the Buam hanwoo steak. I am a big fan of hanwoo and this did not disappoint me. it was good and after dividing it amongst 9 people, we only had one small chunk each. for 30,000won, I’d say go for it. I liked the duck better but this is great for the beef lovers. 부암 스테이크 (한우 채끝)은 정말 맛있었다. ㅠㅠ. 한우를 정말 좋아해서 시킨건데 역시 프랩은 맛있게 했다. 쇠고기를 좋아하신분에게 딱!!! so there’s three races of people in this picture. <3. my dear schoolmates from SKKU. junior, same year and senior.teehee. =D. 민죽성대! 후배, 동기와 선배랑 <3. AHHHH I was so full. despite not ordering a lot for 9 people, I guess most of us had just enough or like myself, I was very filled. it’s really a wonder how Koreans can fit so much into their stomach and not gain weight. I was actually going through lists of cakes to buy the day before and coincidentally my friend gave me a cake as my birthday gift! 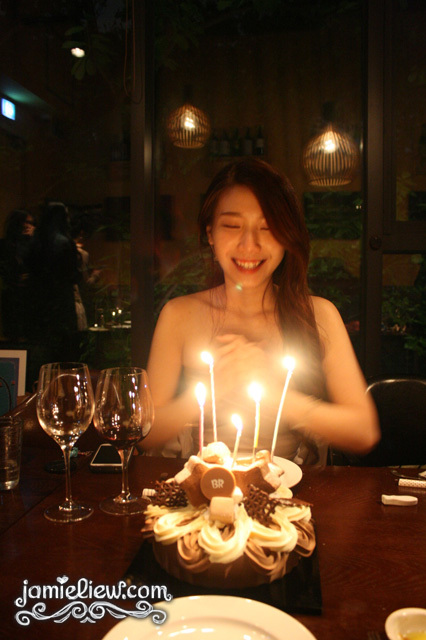 gotta thank Sangjun for this lovely ice cream cake! he couldn’t make it but he sent me a coupon via SMS and voila! it’s crazy how handphone shopping in Korea is like..
상준오빠 사준 케이크! 감사합니다 ^^. 잘 먹었습니다. 상준오빠 못 와서 정말 아쉽다 ㅠ. 그리고 한국의 발달된 스마트폰 쇼핑은 참으로 대단하다. 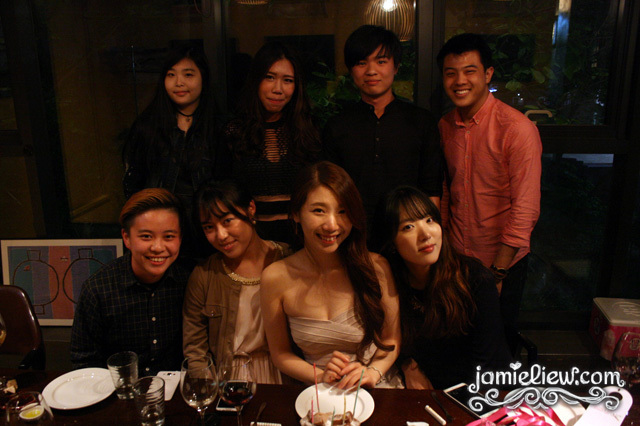 thank you Neoh, Shi Wei, Mandy, Leo, Jiahao, Sheryl, Hizuru and Hyojeong for making my 23rd birthday an exceptionally memorable one <3. I seldom get gifts in Korea but you girls all prepared me something ngawww <3. Neoh too. <3 <3. 네오, 시애, 맨디, 가우, 가호, 셰럴, 히즈루, 효정 와줘서 고마워 <3. 선물까지! 외국인들 대부분 선물 준비하지 않은데 올해 선물 많이 받아서 정말 고맙구 나두 나중에 이쁜 선물 준비해야 겠다! the bill came to a total of almost 300,000won (we also ordered 2 bottles of wine which costs over 40,000won each) and we paid a fair amount of around 32,000won each. Prep had a 50,000won and a 65,000won course but sadly I don’t think I can afford that yet so I shall save more money and just.. go back for that duck and ugeoji pasta that I love =3. not to mention that pizza too!!! how I wish Prep would invite me there for a food review T_____T. oh well.. the best thing about Prep is that, they will not cook you anything on the menu if they don’t have the freshest ingredients. which is another reason why I love it so much. 9명에 30만원 쯤 나왔다. 와인 2버틀 열었고 각 4만원 넘었다. 프렙은 5만원과 6만5천원 코스도 있는데 학생인 저는 그것을 아직은 못 먹겠다. 와인 포함하면 각 6만원에서 8만원인데 어뜨케. 부자돼야함. 한국에서도 파워블러거였으면 리뷰 초대 받을 수 있을 텐데….. 힝. 암튼. 돈 저측해서 그 맛나는 오리와 치츠 피자 또 먹고싶다!! 우거지 파스타도! 프렙의 가장 좋은 점은 바로… 싱싱한 재료만 쓰는것이다. 프렙의 조개요리도 시켰는데 조개가 상태가 별로 안 좋아서 그것을 못 해준다고 했어요. 아 정말 싱싱하지 않으면 서빙 안 해서 에티켓이 좋군요. <3. PS: this place doesn’t is pretty difficult to access and they do not have any English menu so coming here with a Korean friend will be recommended. it’s located at the second floor =). 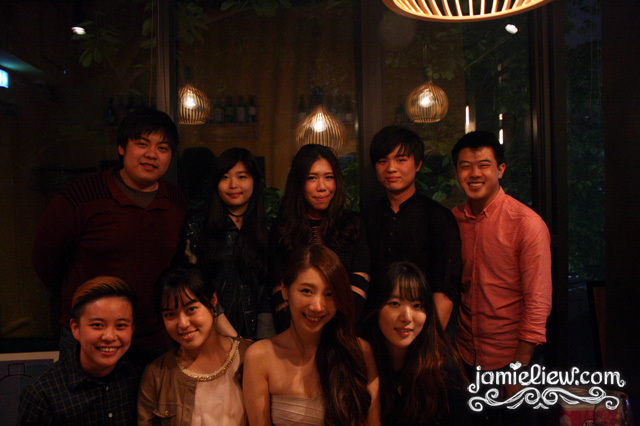 HAPPY BIRTHDAY JAMIE… great to know a blogger with same age as mine. 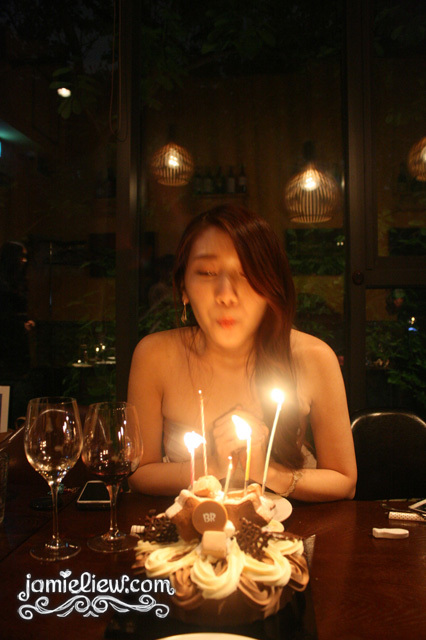 “..exactly one week ago, I celebrated my 19th Birthday…” oh wait 19th? Wow you’re young..oh wait the title says 23rd. that’s because I’ve never felt over 20 before! HEHEHEHEHE.